There are a number of quality Las Vegas romantic restaurants that can fit into anyone’s lifestyle of cuisine. Diners will find a wide assortment of exquisitely prepared cuisine that ranges from a European steakhouse to French to Italian to Hawaiian seafood specialties. The most impressive thing about the restaurants is the view of the Strip or the famed Bellagio Fountains which highlight the meals prepared by celebrity chefs from J. Joho to Julian Serrano to Jean-Georges Vongerichten to David Walzog. The contemporary interiors of each establishment brings romanticism to a new height with Picasso paintings, soft browns and blues as well as an ocean theme worthy of being of Poseidon. Some offer live jazz while other restaurants rely on the dancing waters of the fountains as well as the Lake of Dreams or a fantastic view of the Strip. Each place requires a specific dress code, so patrons should check before making reservations. If you are looking for a Las Vegas romantic restaurant that will transport you to the streets of Paris and more, then you need to try the Eiffel Tower Restaurant. Located at the Paris Hotel within the replicated Eiffel Tower, the Eiffel Tower Restaurant has a contemporary decor with floor-to-ceiling windows that overlook the famous Bellagio Fountains. Serving lunch and dinner the establishment is ideal for all occasions from pre-theater dining to fine dining to power lunches that will help dazzle clients. The atmosphere is electric with sights and sounds of the fountains as well as Strip for you to enjoy while dining on truly remarkable cuisine. Diners can indulge in specialties created by Chef Joho that include classic escargot dishes, foie gras, lobster benedicts and a lamb burger for lunch. Dinner brings the tastes of France to your table with items such as caviar, steak tartare and entrees like Dover sole, ballotine of rabbit as well as a roasted rack of lamb. Price-fixed tastings menus are perfect for theater goers and the Sunday brunch will bring a smile to your stomach. 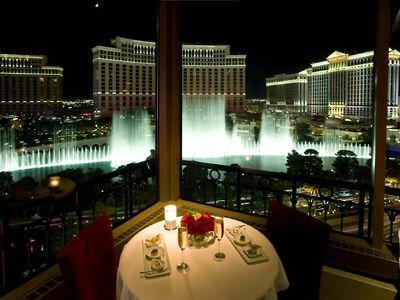 One of the more interesting and intriguing Las Vegas romantic restaurants that offers the best view of the Strip is the Top of the World. 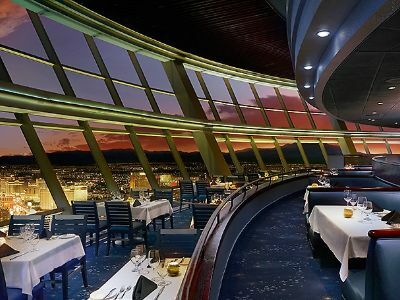 Located 800-feet above the Strip within the Stratosphere Hotel and Casino, the Top of the World boasts an interior packed with floor-to-ceiling windows that offer the best view of the Strip for diners that can enjoy lunch as well as dinner service. The atmosphere of the restaurant is superb from many angles not just the view of the Strip. Diners can relish in watching sky jumpers leap from the Stratosphere Tower as well as an unprecedented 360 degree view as the restaurant rotates within 80-minutes while indulging in classic dishes that range from a price fixed power lunch menu to a truffle burger for lunch. In the evening the menu features specialties like prime cut meats as well as wagyu meat from Japan. The lobster bisque is a must try as well as the bananas foster for dessert which is presented tableside. If that is not enough, then try the lobster thermidor or Fijian tuna which will melt in your mouth while you overlook the bright neon lights of the Las Vegas Strip. The Prime Steakhouse is a fantastic Las Vegas romantic restaurant that features the creativity of celebrity chef Jean-Georges Vongerichten. 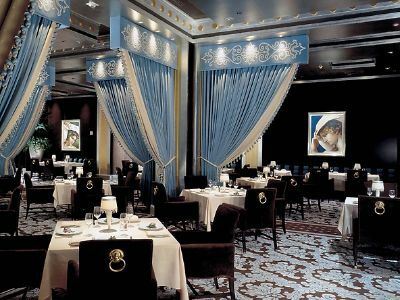 Located within the Bellagio, the Prime Steakhouse has a beautiful interior designed by Michael DeSantis that offers deep browns highlighted by tiffany blues which highlight the meals served for dinner only. The interior of the restaurant is unique with hundreds of commissioned artworks on the wall and a water-themed canvas screen designed by Joseph Raffael. Another surprise that awaits guests at the Prime Steakhouse is the impeccable views of the Bellagio Fountains with the stunning replica of the Eiffel Tower in the background. The menu at the restaurant is a classic European steakhouse with signature steaks, Colorado lamb dishes and plenty of raw seafood as well as classic dishes for starters. Each steak is accompanied by a variety of exquisite sauces that diners can mix and match to please their taste buds as well as truffle mash potatoes which are a must eat. One of the best Las Vegas romantic restaurants that offer an assortment of fresh seafood from the Hawaiian Islands is the Lakeside Grill. 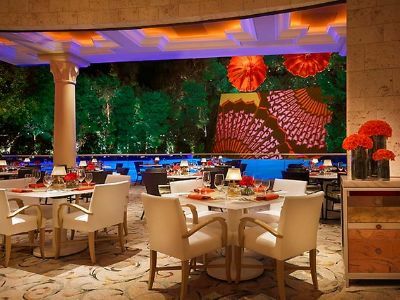 Located within the Wynn Las Vegas, the Lakeside Grill has an astounding ocean themed interior with aquariums, coral reef shaped walls and eclectic furniture for guests who can enjoy the bounty of the Pacific Ocean for dinners as well as a Sunday brunch. Created by Chef David Walzog, the restaurant features an ocean-to-table concept with numerous seafood specialties that are selected by the chef through his partnership with Hawaiian based fishermen. Set next to the Lake of Dreams, diners are fascinating with the beautiful light show each night that appears dancing on the water of the lake. Pre-theater goers can indulge in price fixed menus that bring innovative seafood and steaks to the table paired perfectly with wines. Other menu options include plenty of starters from charred octopus to Hudson Valley foie gras and entrees such as promfret as well as mahi mahi from an Hawaiian day boat. If you are searching for a hidden gem that is a perfect Las Vegas romantic restaurant then you need to go to the Barrymore. Located on Convention Center Drive within the boutique property of Royal Resort, the Barrymore brings a subdued contemporary interior with wood and plenty of glass while diners enjoy a superb dinner menu. The restaurant has an atmosphere that throws you back to the days of the Rat Pack with attentive service, a dress code and a wine selection that has won awards from Wine Spectator Magazine. 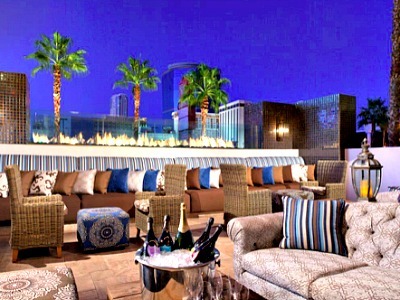 The establishment is chic with a gorgeous rooftop patio overlooking the Strip where you can enjoy cocktails before your dinner. The menu brings classic Las Vegas dining to the forefront with dishes such as chilled seafood platters, lobster mac-n-cheese and the grilled wet or dry aged steaks are accompanied with delicate sauces. The atmosphere while dining gets going with live music during the social hour and continues in a leisurely manner throughout dinner while guests rave about the Barrymore being the hidden gem of Las Vegas fine dining. A fine dining Las Vegas romantic restaurant serving innovative French-Spanish cuisine that is perfect for theater goers as well as couples is Picasso. 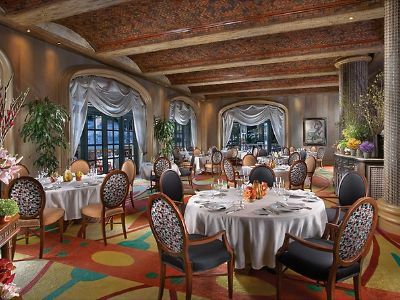 Located within the Bellagio Las Vegas, Picasso has a heavy wood décor with numerous Picasso paintings on the walls and serves dinner while guests overlook the magic of the Bellagio Fountains. The patio offers the best views of the Bellagio Fountains but guests are pleased with the beautiful fountain show from within as well. The restaurant is the creation of award winning chef Julian Serrano who usually appears nightly in the kitchen to make sure his tasty dishes are prepared for guests according to his standards. The establishment has a laid back but fine dining attitude with theater goers enjoying a price fixed menu which leaves patrons satisfied before heading to the shows. Menus have included delights such as roasted milk-fed veal chops, fresh seafood of the day and the chocolate fondat is to die for. Other dining options include a degustation menu which expertly pairs wines with a variety of French and Spanish influenced dishes that bring all of your taste buds to life. An exciting Las Vegas romantic restaurant that boasts the exquisite Italian flavors of famed chef Julian Serrano is Lago. 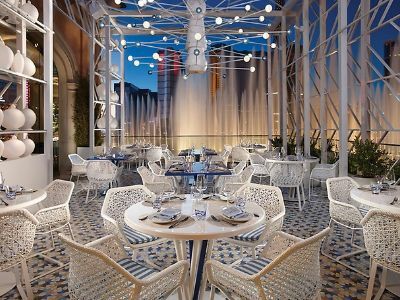 Located within the Bellagio Las Vegas, Lago is situated next to Lake Bellagio with an upscale stained glass interior that offers floor-to-ceiling windows for perfect viewing points of the famed Bellagio Fountains while dining and serves lunch as well as dinner. The patio offers the best views of the fountains, while inside sports a bustling atmosphere with the wait staff serving numerous small plates that dominate the menu. Tasty treats include a red wine risotto, pizzettes, focaccia, salads and tapas. Italian fare is superbly prepared from the lamb ragu to cannelloni to a variety of seafood dishes with pastas. The small plate concept at Lago is ideal for couples to share and ensures that patrons taste a little bit of everything. Weekend brunch brings a three-course price fixed menu which changes weekly depending on the availability of fresh ingredients. A classic French steakhouse with an unpretentious setting that is a perfect Las Vegas romantic restaurant is Mon Ami Gabi. Located within Paris Las Vegas, the Mon Ami Gabi has an upscale interior with crisp white butcher paper on the tables, lots of wood and floor-to-ceiling windows as well as an innovative kitchen which prepares all three meals. The atmosphere of the restaurant is delightfully calm with seating available on the patio which is perfect for people watching, inside the atrium or the bistro and guests are treated to fantastic views of the Bellagio Fountains while they dine, no matter where they are seated. 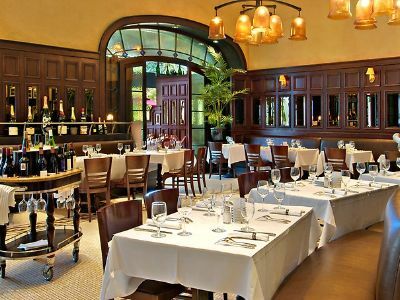 The menus at Mon Ami Gabi bring authentic tasting French bistro and steakhouse fare with standout dishes for breakfast like bananas foster waffles, French onion soup for lunch with traditional French salads, sandwiches as well as classic French entrees. Dinner boasts plenty of French fare from appetizers to entrees and incredible cuts of meat with a variety of delicate French sauces for the main meal. Weekend brunch sports the best of all menus for people to indulge on during a casual meal while watching the water dance within the Bellagio Fountains.